Sister Sumitha Puthenchakkalackal serves a midday meal in Ghaziabad, India. She is one of the Sisters of the Destitute, who live among the poor they serve. Learn more about them in ‘My Great Hope Is the Sisters,’ a profile of their inspiring mission in the Winter 2016 edition of ONE. Sister Hanne, one of the Franciscan Missionaries of Mary, sits with Lucien, a 7-year-old refugee from Qaraqosh, in his residence in Amman. 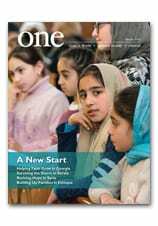 Learn more about the work these sisters are doing with refugees in Welcoming the Stranger in the Winter 2016 edition of ONE. Archbishop Pierbattista Pizzaballa, apostolic administrator of the Latin Patriarchate of Jerusalem, celebrates Christmas Mass at the Church of the Nativity in the West Bank town of Bethlehem. Santa delivered a wonderful gift last week: the Winter 2016 edition of ONE. You can check it out online here, and read the digital edition, with the complete graphics and layouts of our print version, right here. Among the remarkable people you’ll meet in this edition: the loving and generous Franciscan Sisters of Mary, caring for refugees in Jordan; the gifted lay catechists of Ethiopia; and the extraordinarily selfless Sisters of the Destitute in India, who spend their lives living side by side with the poorest of the poor. All this, plus the acclaimed writing and photographs which have made ONE among the most honored publications in Catholic media. From all of us at CNEWA, to all of our loyal and generous readers: Merry Christmas and Happy New Year! Thank you for being a part of our world — and supporting others who are a part of it, too.